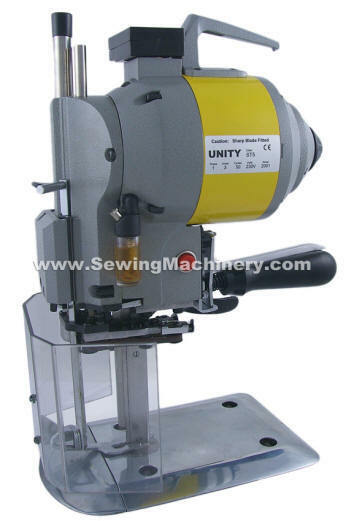 Unity model ST5 is manufactured as a smaller and lighter straight knife cloth cutting machine for easier operation and better manoeuvrability. The machine has been designed for users who are cutting low lays up-to 85mm in depth. It features a shorter than normal knife stroke and small + narrow cutting standard which operates better and reduces the cutting warp associated with standard bigger machines when trying to cut low lays of material. Ideal for users who require the versatility of a straight knife machine matched to cutting low lays or for those wanting a smaller/lighter easier to use fabric cutter. Die cast housing to reduce weight. Built-in push button blade sharpener. Short knife stroke for low lays. Small and Narrow cutting standard to reduce drag and cutting warp. Low profile base plate with rollers.